Here We Go Again is a crazy wrap, just glorious to drape around your shoulders. 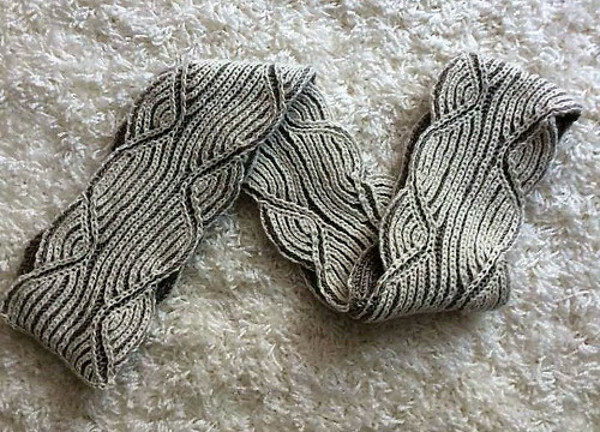 Two hanks of contrast double-knitting yarn are used to create this shawl. 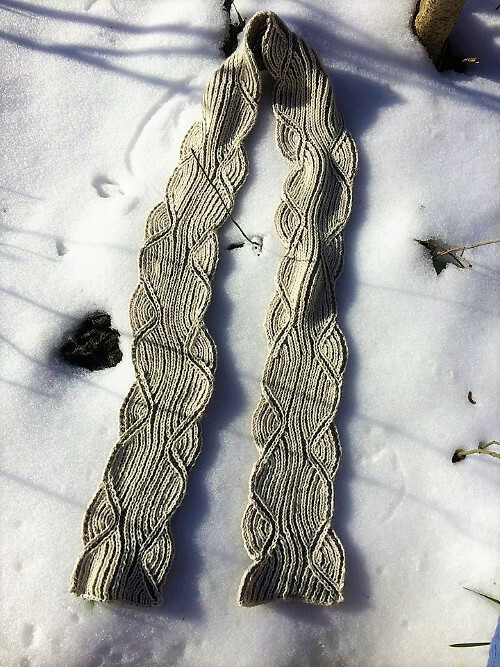 You begin by creating a long narrow brioche piece of fabric, with an interesting flared end. 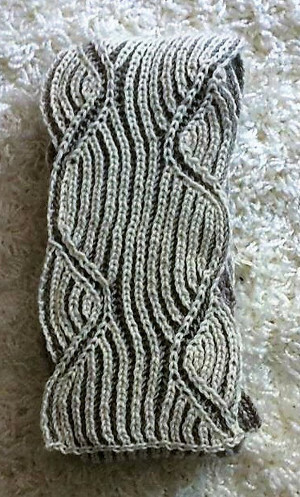 The slipped stitches, at the long edge of the brioche piece, are picked up to work the striped stocking stitch section. It is enveloping; to swoosh around you for work or play. GAUGE: 20sts to 10cm on 4mm needles in Stocking St.
brk: brioche k also known as bark, k st (that was sl in previous row) together with its yarn over. brp: brioche purl also known as burp, p st (that was sl in the previous row) together with its yarn over. sl1yo following a k or brk st: (sl 1 yarn over) bring working yarn under needle to front of work, sl next st purl-wise, then bring yarn over needle (and over sl st) to back, in position to work following st.
sl1yo following a p or brp st: (sl 1 yarn over) working yarn is already in front, sl next st purl-wise, then bring yarn over needle (and over sl st), then to front under needle, into position to work following st.
brkyobrk: 2 sts come out of centre of one st with this increase. Work a brkyobrk as follows: brk1 (leave st on needle), yo (yarn forward under needle then over needle to back), then brk1 into same st. 2 sts increased. brRsl dec (2-st decrease slants to right, involving 3 sts) = sl first st knitwise, k next st, pass slp brk over, place st on left hand needle and pass following brk over. Place st on right hand needle. 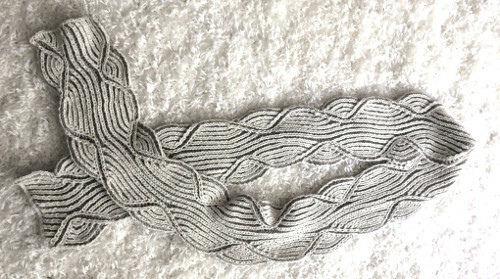 brLsl dec (2-st decrease slants to left, involving 3 sts) = sl first st knitwise, brk following two sts together, pass sl st over st.
Yarn 1 x LIGHT MOONSHINE undyed (£17) + 1 x COBBLESTONE (£15).